Brief Info: IDBI Bank recruitment for 500 Assistant Manager Posts all over India. 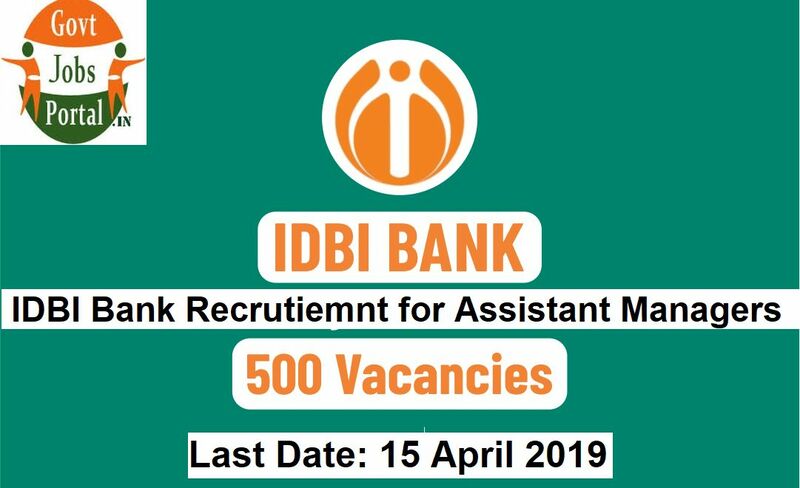 IDBI bank recruitment department has issued a notification for the employment of Asst Manager vacancies all over India in various branches of the bank. Those Applicants who are concerned and interested to these vacancies of Assistant Managers can apply online but before applying online applicants must accomplished all Suitability Standards which we explained below in this article. What is the Application Fee for Applying ? Method of Payment: You have to pay the application fee through online method only. You can pay by using following methods: “Debit Cards (RuPay/ Visa/ MasterCard/ Maestro), Credit Cards, Internet Banking, IMPS, Cash Cards/ Mobile Wallet”. 15th April 2019 is the End Date to apply Online. 17th May 2019 is the Tentative Date of Online Test. Minimum Age of the Applicants: 21 Years. Maximum Age of the Applicants: 28 Years. · Age will be calculated on the basis of 1st March 2019. Applicants should own a Graduation degree from a recognized university in any stream. 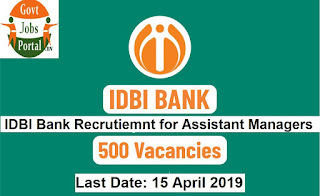 High qualification candidates can also apply for this IDBI Recruitment for 500 Assistant manager posts 2019. · 55% Marks in Graduation from the following categories candidates: “SC/ST/PWD”. · Graduation Percentage for Remaining Categories candidates is 60%.